An unusual design housed within a generously-proportioned case diameter of 45 mm. 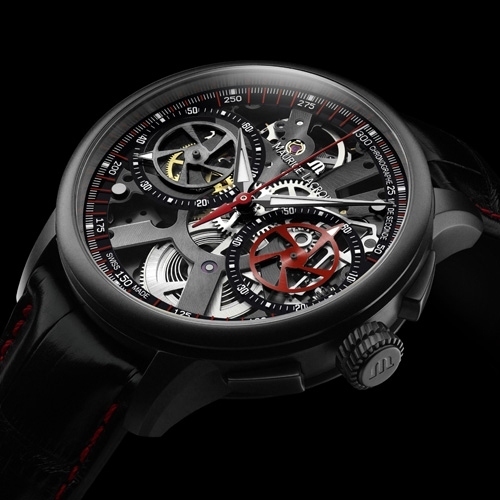 A skeleton watch that reveals the anatomy of time with its Manufacture movement, the ML106 caliber. The most recent version of the Masterpiece Le Chronographe Squelette commands respect. Its precise mechanics and updated appearance are the cornerstones of an undeniably contemporary collection. Protected by a sapphire crystal with an anti-reflective coating on both sides, the manually wound movement is proudly on display. Within this awe-inspiring labyrinth, the workings of the skeletal structure convey a sophisticated, extremely sporty image that is resolutely masculine. Hypnotized by the movement’s intricacy, the light bounces off the sharp, luminous hours and minutes hands before plunging into the depths of the skeleton. The multi-level effect is accentuated by the snailed architecture of the bottom plate, and the contrast between the black screws and the gemstones. The skeletonized openwork allows for the gears, the escapement, the balance and the column wheel, a feature of all the finest chronographs, to be admired. The counters, including a 60-minute counter, have hands shaped like skeletal disks which resemble the gears of the movement, while the time indicators are applied to the sapphire crystal dial. The structure of the Chronographe Squelette transforms inorganic matter into a living and exciting mechanism that displays each of its Manufacture-crafted components with pride. Four variations reveal their individual characters, whether classic or sporty, but always unique in their kind. The design of this metallic piece of watchmaking art is an appropriate icon for a brand that has dared to create an elegant yet edgy collection. Compromise does not form part of Maurice Lacroix's vocabulary. Standard buckle with full black PVD coating. Decorations: Hand-decorated bridges plated with rhodium, ruthenium (black), blue nickel or pink gold. Limited Edition of 4 x 99 pieces.